Morning cryptonites, today I will be reviewing the service provided by Cryptopay.me. As oldtimers and newcomers are aware, the ultimate pain in the back side for trading and purchasing with Bitcoins is exchanging them for traditional money. I use Bitstamp as my main Bitcoin exchange and then Poloniex for wider Cryptocurrency trading. Bitcoin can take up to a week to send and receive money from your UK bank account. Firstly, let us observe the irony. Bitcoin enables users to send value around the world in less than an hour. But, as soon as you convert back to fiat it takes a week to send between bank accounts in Europe. This is one of the reasons that I believe the technology behind Bitcoin will be so revolutionary. So as regular users, what options do we have to bring our Bitcoins home to real money back here in the UK? Well, something that has been gaining traction over the previous couple of years in Bitcoin debit cards. There are now multiple providers available to individuals trading Bitcoin in the UK, see some of the overviews here. I decided to try one out to see for myself what the service was like and whether it will form part of my conversion methods in the future. So I signed up to Cryptopay, which was a very seemless process, they only require an email address and a password at this stage. As you can see below, the dashboard consists of different currency accounts; EUR, USD, GBP and BTC. I think this a very pleasant to use dashboard and easy to understand. You send BTCs to these accounts via the public key. If you send to a fiat account, it makes the conversion for you within the dashboard. You can then purchase a debit card with the funds in your account. There is the option of a virtual Bitcoin debit card and a plastic Bitcoin debit card. I went for the plastic, as I want to test drawing physical cash out. However, the virtual one allows you to make purchases online. Once an order is placed, Cryptopay asks for your name and address, for both verification purchases and postage. Although, you do have the option to have it posted it elsewhere. The fee is taken from one of your accounts and then the card is dispatched. 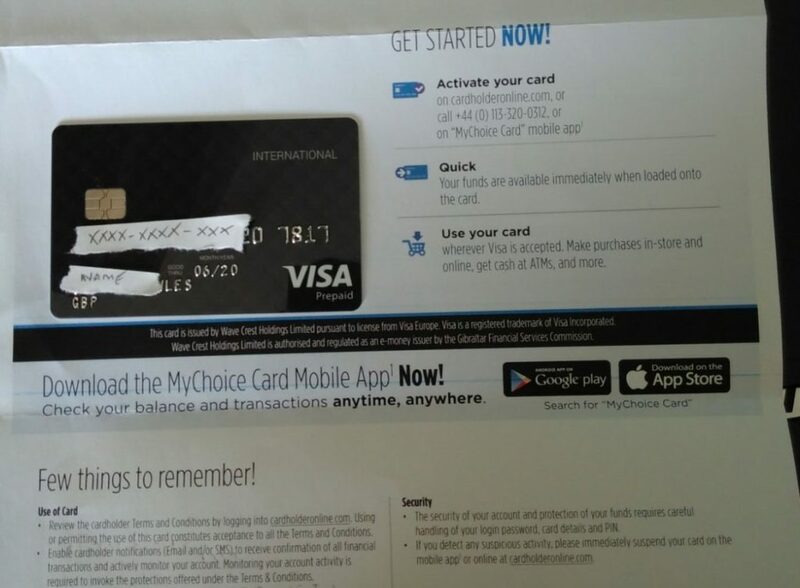 The card took only a couple of days to arrive to me in the UK. 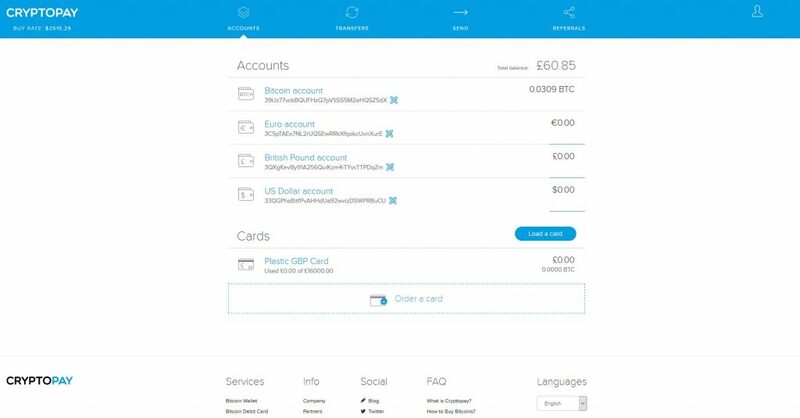 It doesn’t have the same appearance as shown on the website, it is without the “Cryptopay” logo. Which maybe is a bit of a downer, as I wanted to slap it in the face of people whilst making purchases. But it isn’t going to affect the usability. Once it arrives you need to activate by ringing an enthusiastic automated voice service and provide the card details. Once that is done, it’s ready for usage. However, there are limits. As with the majority of Bitcoin services you have to provide evidence that you are who you say you are. If you don’t go through this process, you can only spend up to £100 on this card. Once you have confirmed your identity, the card becomes unlimited. I submitted my proof of identity and it only took a couple days to confirm. So finally, price comparison. I initially signed up to Bitstamp years ago, as it was the cheapest on back then. So this comparison is against it. But the figures are below for you to consider. I think my final analysis is that it depends on the amount you wish to take out. I based the model on taking out £50 for a birthday party or something. It is clear that Cryptopay is by far the best option, it’s much cheaper and it’s instant. The variable is the percentage fee; Cryptopay charge a 1% Load Fee and Bitstamp charge a 0.09% Withdrawal Fee, with minimum fee of $15. There is a small unknown from Bitstamp termed “bank charges” too – the “£50ish”. Based on those fees I think the £1000 mark is where Cryptopay stops becoming the cheaper option and Bitstamp is cheaper. If you used Bitstamp then, you would still need to wait a week though. So, there you have it. If you like the look of Cryptopay, feel free to sign up through my referral link. Hope it was of interest.